Diamonds of large size are exceedingly rare. As a diamond increases in size the value increases dramatically as the supply drops, and demand for these rare gems rises. The unit of measurement for diamonds (and other gems also) is the metric carat (ct). No, NOT karat (ie 14K), that signifies gold purity an entirely different unit of measure. The name comes the carob seed which was used as a counterweight on balance scales by gem merchants. The seed was quite uniform for weight, so it useful for this purpose. Today a carat is a metric unit: one carat weighs exactly 0.2 grams. That means a five carat diamond weighs exactly one gram. An average paperclip weighs about one carat. 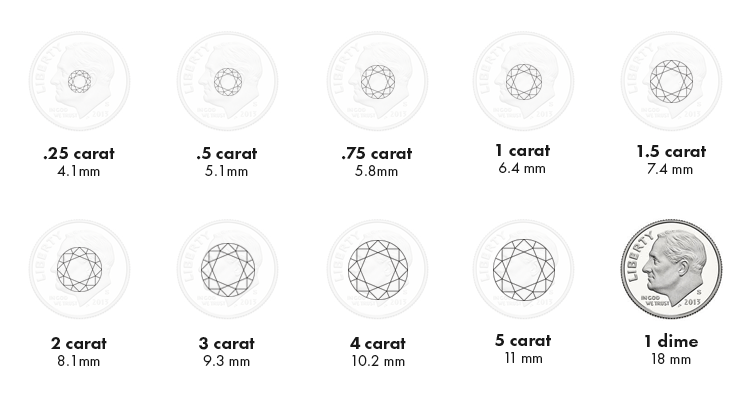 Carats are divided into units called points. A 1ct diamond weighs exactly 100 points. So a diamond that weighs 0.75ct (exactly three quarters of a carat) is sometimes referred to as a 75 point diamond. This is a question we are asked a lot by customers that stop by our store. A one carat diamond SHOULD measure about 6.4mm in diameter. That is the average size. We have encountered one carat diamonds that measure close to 7mm, and then others almost the size of a typical 3/4ct - about 5.8mm! Many diamonds vary considerably from the average size and knowing why is an important part of your buying decision. A wider than normal one diamond means the weight is distributed outwards, and the overall depth will be too shallow to produce fire and brilliance. A smaller than typical diameter means the weight is distributed vertically in either an overly thick girdle or a steep base on the diamond. This too leads to a dull looking diamond. The subject of what makes a diamond look it's best is a prodcut of the cut grade. Read more about Cut Grade here.